Welcome to the Lazy Susan Ltd Terms and Conditions for Use. These Terms and Conditions apply to the use of this website at www.lazysusanfurniture.co.uk. By accessing this website and/or placing an order, you agree to be bound by these terms and conditions. 1.1. You will be able to access most areas of this website without registering your details with us. Certain areas of this website are only open to you if you register. We may revise these terms and conditions at anytime by updating this posting. You should check this website from time to time to review the then current terms and conditions because they are binding on you. Certain provisions of these terms and conditions may be superseded by expressly designated legal notices or terms located on particular pages of this website. If you do not wish to accept any new terms and conditions after we have given notice, you should not continue to use this website. 2.1. 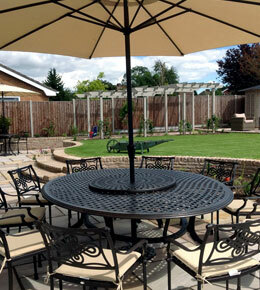 Lazy Susan Garden Furniture focuses on metal garden furniture including patio furniture sets and accessories which are supplied to the UK and Europe. 2.2. 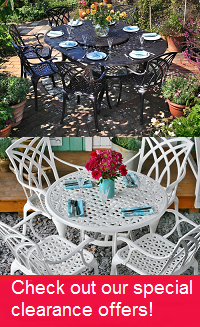 You can buy many items online or call to make an appointment to view the garden furniture at our warehouse in Chichester at Lazy Susan Ltd: The Courtyard I Terminus Road, Chichester, West Sussex, PO19 8TX. 3.1. You are deemed to place an order with us ordering our online checkout process or by placing an order with us by telephone. As part of our checkout process you will be given the opportunity to check your order and to correct any errors. 3.2. We will send you an order acknowledgement detailing the products you have ordered. 3.3. We will send you a dispatch confirmation by email. When we dispatch the order the purchase contract will be made, even if payment has been processed immediately unless we have notified you that we do not accept your order or you have cancelled your order. (b). (if earlier) by the dispatch by us of the goods contained in the order to you, when a contract for the sale and purchase of the goods on these terms and conditions will be established. (d). if you do not meet any eligibility criteria set out in our terms and conditions. 3.6. You are not obliged to pay a deposit when placing your order. 3.7. Due to the difficulty in accurately estimating the production and delivery timetable since the manufacture of the products is located overseas you agree that Lazy Susan Ltd is not liable for any loss or damage that you may incur due to delays for delivery of the goods. a.) the order was for a standard product and where the products have not been delivered within 90 days of the date estimated for delivery by Lazy Susan. 3.9. You are responsible for measuring and ensuring the dimensions of the goods that you buy from Lazy Susan are suitable and can be accommodated in its intended destination. Lazy Susan Ltd will not refund you for failure to measure furniture which subsequently cannot fit into your intended destination. 3.10. If you are ordering through Lazy Susan Furniture a Credit or Debit Card we will authenticate the card details at the point in which you checkout. We will only charge you for the order once it has been dispatched. The 'authentication' process means the amount needs to be debited from your account within 30 days. Therefore, if dispatch is not made within 30 days of the order being placed we may need to call you to authorise the details once again. 4.1. Dining tables will require assembly on delivery. Whenever possible in the UK, Lazy Susan can deliver and assemble larger garden table (this applies to the larger 8-10 seater tables). 4.2. Delivery of any goods will be to the garden or patio when Lazy Susan undertakes the delivery. When a third party carrier is instructed to make the delivery the delivery is to the front door and the customer is responsible for moving the goods to the intended destination. 4.3. Lazy Susan delivery staff endeavours to deliver goods during a prearranged time slot. Events outside of Lazy Susan's control may however affect the ability to deliver goods during this time slot and Lazy Susan cannot be responsible for any delay arising in this manner and notwithstanding any delay you agree to pay the delivery charges where applicable. 4.4. Risk or damage to or loss of the Products shall pass to you upon delivery. 4.5. Title in the Products shall pass to you only after Lazy Susan has received payment in full. 4.6. If you order more than one product, you accept that Lazy Susan may wait until all items are available before arranging for delivery of the products to you. 4.7. You accept that if you are not present to accept delivery during the prearranged time slot you will be charged for delivery charges and you will not be entitled to a refund if you are not present to accept delivery. 4.8. You are responsible for ensuring that there is adequate delivery access to enable Lazy Susan delivery staff to deliver the products. If Lazy Susan delivery staff are unable to deliver the products due to inadequate or restricted access you will pay the delivery charges and if applicable, a collection fee together with a restocking fee equivalent to 30% of the purchase price. 5.1. Or prices include VAT. 5.2. The appropriate rates and change for delivery, packing, and insurance and any other relevant charges are set out in our specified pricing structure shown on this website. 5.3. Our prices and other relevant charges are reviewed periodically and you should review the rates on the web site before placing an order. When Lazy Susan Ltd is not able to supply all of the items that complete the garden furniture set ordered, the customer will be able to choose between alternative goods or a partial or full refund. Our special offers run throughout the year. Most of our offers are Subject to a minimum spend on our website The larger the set you purchase, the better discounts you are likely to be offered. Eligibility for these offers is clearly outlined on our website and Lazy Susan reserves the right to refuse offers to those not achieving the threshold minimum spend. 7.1. All risk in the goods shall pass to you when the goods are taken from our vehicle at your address. 7.2. In accordance with the Consumer Protection Regulations 2000, goods can be returned within 7 days. This can be done by contacting the customer services department. 7.3. Faulty Goods: A seven day money back guarantee exists for faulty products. Evidence of any faults will be needed to be supplied by the customer. This means that a replacement product can be offered or alternatively we will offer a full refund equal to the value of the returned product. It is essential that any faulty products made available for return in the exact condition in which it was delivered, along with the original packaging or similar. Items which are not adequately packaged at the time of collection may not be collected and a charge may be levied to cover the cost of failed collection. There will be no collection charges for faulty goods if the preceding conditions are adhered to. Once the faulty product has been successfully returned, a replacement product or a full refund will be arranged as quickly as possible. 7.4. Non-Faulty Goods: If the customer is dissatisfied with his/her purchase and wishes to return some or all of the items from his/her order, contact with us must be made within seven days of the original purchase. The customer can either arrange to return the goods to the supplier at his/her own cost or ask a collection to be made at the cost of £75.00 which will be deducted from the refund. Goods must be returned to us in the same condition they were in at the time of delivery to the customer and in the original packaging or similar. Items which are not adequately packaged at the time of collection may not be collected and a charge of £45.00 may be levied to cover the cost of failed collection. Refunds will be issued within 30 days of receipt of goods and after we have inspected them for damage. We reserve the right to withhold all or part of your refund if items are returned damaged. 7.5. Goods purchased at a discounted price are sold as seen and cannot be returned. Many of the goods sold at a discounted price are imperfect or end of line stock. 7.6. Your statutory rights to a refund of the purchase price for goods that are not of satisfactory quality are unaffected by these terms and conditions. 7.7. Goods will not be exchanged or a refund given for goods unless a proof of purchase from Lazy Susan is produced. (c). Our copyright and trademark notices and this permission notice appeal in all copies. 8.2. Any incorporation of any part of this web site in any commercial document or materials for sale or promotion is not permitted unless you obtain our prior written consent. 8.3. Unless otherwise stated, the copyright and other intellectual property rights in all material on this website (including, without limitation photographs and graphical images) are owned by us. For the purposes of these terms and conditions: any use of extracts from this website other than in accordance with clause 8.1. above for any purpose is prohibited. If you breach any of the terms in these terms and conditions your permission to use this website automatically terminates and you must immediately destroy any downloaded or printed extracts from this website. 8.4. Subject to clause 8.1. no part of this website may be reproduced or stored in any other website or included in any public or private electronic retrieval system or service without our prior written permission. 8.5. Any rights not expressly granted in these terms are reserved. 9.1. While we endeavour to ensure that this website is normally available 24 hours a day we will not be liable if for any reason this website is unavailable at anytime or for any period. 9.2. Access to this website may be suspended temporarily and without notice in the case of system failure maintenance or repair or for reasons beyond our control. (d). which is technically harmful (including, without limitation, computer viruses, logic bombs, Trojan horses, harmful components corrupted data, or other malicious software or harmful data). 10.3. You may not misuse the website (including, without limitation, by hacking). 10.4. We will fully co-operate with any law enforcement authorities or court order requesting or directing us to disclose the identity or locate anyone posting any material in breach of clauses 10.2. or 10.3. 11.1. Links to third party websites on this website are provided solely for your convenience. If you use these links you leave this website. We have not reviewed all of these third party websites and do not control and are not responsible for these websites or their content or availability. Therefore do not endorse or make any representations about them or any material found there or any results that may be obtained from using them. If you decide to access any of the third party websites linked to this you do so entirely at your own risk. (g). your website does not contain content that is distasteful, offensive or controversial infringes any intellectual property rights or other nights of any other person or otherwise does not comply with all applicable laws and regulations. 11.3. We expressly reserve the right to revoke the right granted in this Clause 11.2. for breach of these terms and to take any action we deem appropriate. 11.4. You shall fully indemnify us for any loss or damage us or any of our group companies may suffer or incur as a result of your breach of clause 11.2. 12.1. To register www.lazysusanfurniture.co.uk you must be over eighteen years of age. 12.2. Each registration is for a single user only, do not permit you to share your username and password with any other person nor with multiple users on a network. 12.3. Responsibility for the security of any passwords issued rests with you and if you know or suspect that someone else knows your password, you should contact us immediately. 12.4. We may suspend or cancel your registration immediately at our reasonable discretion or if you breach any of your obligations under these terms and conditions. 13.1. While we endeavour to ensure that the information on this website is correct, we do not warrant the accuracy and completeness of the material on this website may make changes to the material on this website or to the products and prices described in at any time without notice. The material on this website may be out of date, and we make no commitment to update such material. 13.2. The material on this website is provided without any conditions, warranties or other terms of any kind. Accordingly, to the maximum extent permitted by law, we provide you with this website on the basis that we exclude all representations warranties conditions and other terms (including without limitation the conditions implied by law of satisfactory quality fitness for purpose and the use of reasonable cale and skill) which but for these terms and conditions might have effect in relation to this website. You acknowledge and agree that details of your name, address and payment record may be submitted to a credit reference agency and personal data will be processed by and on behalf of Lazy Susan Ltd.
15.1. Lazy Susan Ltd and its officers, directors, employees, shareholders or agents, exclude all liability and responsibility for any amount or kind of loss or damage that may result to you or a third party (including any direct, indirect, punitive or consequential loss or damages, or any loss of income, profits, goodwill, data, contracts, use of money, or loss or damages arising from or connected in any way to business interruption, and whether in tort, contract or otherwise) in connection with this website or in connection with the use, inability to use or the results of use of this website, any websites linked to this website or the material on these websites. 15.2. 15.2. Nothing in these terms and conditions shall exclude or limit our liability for (i) death or personal injury caused by negligence (as such term is defined by the Unfair Contract Terms Act 1977); (ii) fraud; (iii) misrepresentation as to a fundamental matter; or (iv) any liability which cannot be excluded or limited under applicable law. 15.3. 15.3. If your use of material on this website results in the need for servicing repair or correction of equipment software or data, you assume all costs thereof. 15.4. You agree to indemnify us fully defend and hold us, and our officers directors, employees and agents, harmless from and against all claims liability damages losses, costs (including reasonable legal fees) arising out of any breach of the terms and conditions by you, or your use of this website or the use by any other person using your registration details. Lazy Susan shall have no liability to you under the agreement if it is prevented from or delayed in performing its obligations under this agreement or from earning on its business by acts, events of omissions or accidents beyond its reasonable control, including strikes, lock-outs or other industrial disputes (whether involving the workforce of Lazy Susan or any other party), failure of a utility service or transport network, of God, war, riot, civil commotion malicious damage, compliance with any law or governmental order, rule, regulation or direction, accident, breakdown of plant or machinery, flood, storm or default of suppliers or sub-contractors. 17.2. If any invalid unenforceable or illegal provision would be valid enforceable or legal if some pan of it were deleted, that provision will apply with whatever modification is necessary to make it valid, enforceable and legal. 17.3. The parties agree: in the circumstances referred to in condition 17.1 and if condition 17.2 does not apply to attempt to substitute for any invalid, unenforceable or illegal provision a valid enforceable and legal provision which achieves to the greatest extent possible the same effect as would have been achieved the invalid or unenforceable provision. 18.1. Each of the parties acknowledges and agrees that: in entering into this agreement it does not rely on any undertaking, promise, assurance, statement, representation, warranty or understanding (whether in writing or not) of any person (whether party to these terms and conditions or not) relating to the subject matter of this agreement other than as expressly set out in this agreement. 19.1. These terms and conditions shall be governed by and construed in accordance with English law and disputes arising in connection with these terms and conditions shall be subject to the exclusive jurisdiction of the English courts. 19.2. We do not warrant that material items for sale on the website are appropriate or available for use outside the United Kingdom. It is prohibited to access the website from territories where its contents are illegal or unlawful. If you access this website from locations outside the United Kingdom, you do so at your own risk and you are responsible for compliance with local laws. 20.1. You may not assign sub-license or otherwise transfer any of your lights under these Terms and Conditions. 20.2. 20.2. Paragraph headings shall not affect the interpretation of these Conditions. 20.3. Only the patties to these terms and conditions may seek to enforce them under the Contracts (Rights of Third Parties) Act 1999. As it is extremely rare for any breakage to occur, even if you are outside of your 12 month guarantee, we still look after you. If anything were to go wrong with the furniture a few years down the line simply call or email and we will take it from there. We will try our best to offer all customers replacement parts at the best possible prices.